By taking a closer look at daily processes and systems, many shops have uncovered ways to save time and money. We’ve helped shops learn to reduce cycle times and streamline processes. With the consulting services we offer through Akzo Nobel, you’ll soon see a difference in your productivity and profitability. 5S is an approach to organizing and managing a workspace. By implementing the five steps, many collision repair shops have discovered a more efficient way of working that helps to eliminate waste, improve flow and streamline processes. 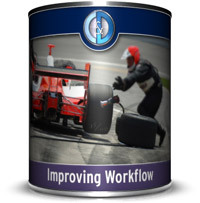 Getting “lean” is a proven way to improve your shop’s efficiency and profitability. Learn how.